Y our True DNA! Discovering God’s Gift Within You! STUCK? Why Keep Wondering About the Purpose of Your Life? Why do so few people find meaning, fulfillment, and Joy in their life? Why are so many people float aimlessly in a sea of confusion about what they are suppose to do with their lives? The answer is they don’t discover their gift and how to apply it in the opportunities that come into their life. They are too busy creating possibilities that never work out rather than focusing on the opportunities that naturally come their way. Who are you? What is the purpose of your life? What are you going to do with the rest of your life? Why do you feel unfulfilled? Why is the world passing you by? Why is there no direction in your life? Why do you feel unappreciated? Why haven’t things turned out the way your planned? WHEN YOU DISCOVER YOUR GIFT, THE ANSWERS TO YOUR LIFE BECOMES CLEARER! You have a unique gift; each of us has a unique gift! The gift is part of your DNA (Divine Natural Attribute) that connects you to Divine Intent for you life. It makes all the difference in the purposing, fulfilling, satisfying, joyful, and meaningful outcome of your life. Make better choices for your future. Recognize the Divine Intent for your life. Begin to identify the opportunities that come your way. Release the strength of the Spirit when you are challenged. Reduce the never-ending tension in your daily life. Your True DNA challenges you to stop looking at the surface level of “success” but to dive deeply into you own D.N.A., the Divine Natural Attribute; a part of our soul, your unique Gift. Thom’s goal is to show you how to discover what you are intended to be. Discover your purpose in life, experience a new focus and a fruitful path will be illuminated. Your True DNA will help you cut through the noise of life and give you clarity. This wonderful book by Thom Winninger will inspire you with clarity and direction so you can accomplish more in the next year than many people accomplish in five or ten years. 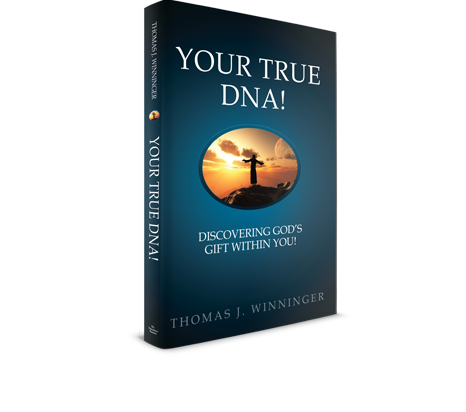 Winninger’s wisdom frames substantive concepts and practical ideas for you search for Your True DNA and gives you the resources you need to have a life of significance. Your True DNA reveals a powerful logic of gift that captures how we operate when we are at our best. Winninger explains this logic in an accessible and practical way helping readers discern their gift and find their purpose. His book is a wonderful gift to us all.